When aquaculture was introduced through Canadian Feed The Children’s (CFTC) food security project RESULT, women enthusiastically joined knowing they could cultivate high-protein food and earn money at market by fish farming on local dams. 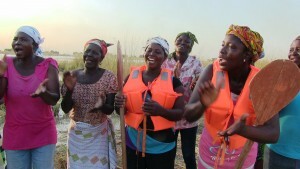 Since then, the interest in aquaculture as an alternative income generating activity for women has spread beyond local RESULT communities – piquing curiosity across Ghana and internationally about this new initiative helping to empower women, in a country where arable land ownership rights are held mostly by men. This interest culminated in an Aquaculture Stakeholders Forum this past May in Tamale, Ghana – led in partnership by CFTC, ACDEP, and the Ministry of Local Government and Rural Development – and sponsored by Global Affairs Canada. 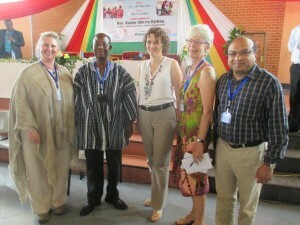 The forum brought together national and international experts, practitioners, and policy makers on aquaculture to Northern Ghana to share knowledge and best practices. Through the RESULT project, CFTC has spearheaded aquaculture in three northern economically-challenged regions of Ghana – regions which are now predicted to become leaders for this fast-growing industry. To date, 70 per cent of participants in CFTC’s aquaculture program have been women, helping to ensure food security, nutrition, and income for their households. 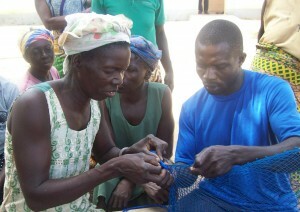 RESULT provides groups of farmers with the start-up inputs for one six-month cycle of production in small-scale fish cages. The groups are provided with five cages, a canoe, initial stocking of 7,000 young fish, and training on net mending, business planning, harvesting and marketing. The fish that survive and grow are used for sale and consumption, and the revenue is used to restock the cages for another production cycle. With recent statistics showing fish production from Ghana’s natural bodies of water in deep decline – current production meeting only 50 per cent of the overall need in a country with one of the highest fish consumption rates in Sub-Saharan Africa – aquaculture is posed to help overcome this challenge. Smallholder farmers like Til-Bo-onbon that are working through the RESULT project report eating fish more than five times per week – a sign of the increased wealth and food security the project has brought to these communities. Attendees at the Aquaculture Stakeholders’ Forum were keen to leverage the successes of CFTC’s aquaculture project, looking to apply best practices and expand construction of hatcheries across the country to help improve women’s livelihoods so they can better support their families.